Few people feel there is such thing as too much storage space in their home. More closets, cabinets, and places to store things make homeowners happy, and this might even be a major selling point in some homes. Buyers who walk into homes with a lot of storage space find themselves excited about the prospect of having a place to store the kids’ toys and the holiday decorations. The same buyers might find themselves ready to walk out of a home without enough storage space. Whether you’re in the market to sell or you simply need more storage space yourself, there are a few features you can include in your home that add more storage space for your belongings. 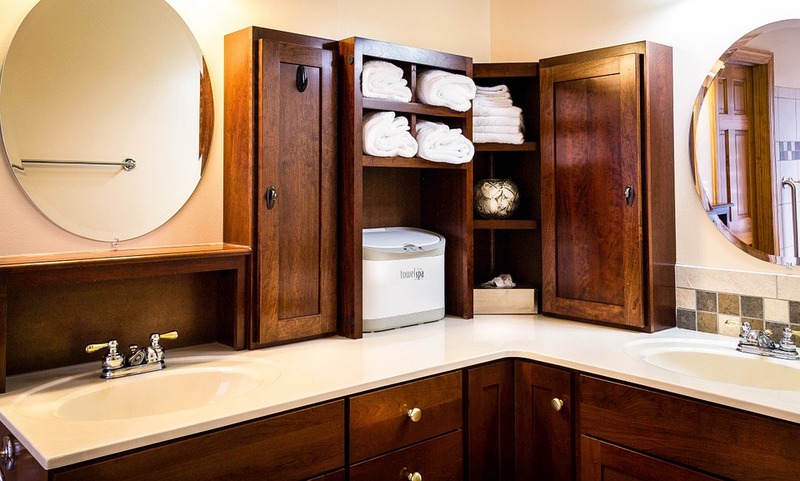 If you’re building or remodeling, it’s easy to find creative ways to add more storage space. The kitchen is always a room that can use more storage, and a slide out pantry is a great way to provide that. It takes up very little space, but it adds a tremendous amount of value to anyone who uses your kitchen. This slide-out space fits beautifully in between the dead space between a counter and an appliance. It’s narrow, almost unnoticeable, and it’s accessible from both sides. Most people build it wide enough to store their spices and herbs in it, but there is no reason you cannot add enough width to also use it as a storage place for cans. Do you have cabinets in your kitchen and bathroom? If you do, it’s time to remodel that situation and add some more space. Here are a few ideas. If you have small kids and a small bathroom, you can save a little space by adding a built-in step stool to the dead space under your bathroom cabinet. This saves space on the floor, which means no one is tripping over a step stool every time they use that bathroom. The kids pull it out as needed, and they push it back when it’s not needed. The other way to add more storage space is in your kitchen. Instead of dead space under your cabinets, add drawers. They can be pulled out and used as storage for things you don’t use all that often. Put your holiday tablecloths and hand towels in them. Use them for extra pan storage. No one will be upset to lose dead space and gain storage. Some people have high ceilings and short cabinets, and it’s a waste of space. Spend a little extra money during your build or during your remodel by adding the tallest cabinets that fit into your kitchen. Just remember to add shelves to them so you can use the taller spaces to store things. You won’t be able to access this area without a ladder, so it’s helpful to use this storage space for items that you don’t use all that often. Do you have a stairwell? If you do, there’s probably some dead space below it. See what you can do about adding a door to that area that allows you to access that dead space. You might be able to use it for storage or even as an emergency room. If the access point is inside of a closet, it makes an excellent place to hide Christmas gifts when they’re not wrapped. You can then store your wrapping paper, boxes, and other holiday items in there when you’re not using them. It’s a helpful storage solution. Sometimes, the best way to add some storage space at home is with a shed from https://shedquotes.com.au. Sheds aren’t indoor storage space, but they open up a lot of space in your garage. Garages have become another storage space at home, but that often means you’re left without room for your vehicle. You’d rather use your garage for its intended purpose, and a shed can help you make that possible. Another great way to find more space in your garage is with storage racks. Many people have them installed high on the ceiling above the area where the garage door opens. You can easily access it with a ladder, and you can use it to slide boxes and storage containers up there. Holiday décor and other items you don’t use regularly make great items to put up there. If you don’t have much attic space or any at all, this is a creative solution for everyone. One of the best ways to add more storage space is with a quality closet organization system. Even the largest closet comes with its fair share of dead space you cannot use, and that’s not helpful. You can make even the smallest closet more functional if you use an organization system. You can fill dead space with storage shelves, and you can make it more user-friendly. Adding secondary shelving and rearranging the location of current shelving makes more room for you to hang your clothing, to store shoes, and to keep your other items. Adjustable shelves in closets are another helpful tool. Those pre-fixed shelves don’t allow homeowners to move them around to make more space, but sometimes you need more space. For example, a hallway linen closet is a great space in any home, but it’s not useful if your blankets and pillows are too big to fit easily onto shelves. By adding adjustable shelving to closets, you can easily customize your shelves to work for you and your storage needs. Future buyers can do the same, and it can add some value to your home in their eyes. Adding more space at home is always helpful. You can add more storage space using these tools, and you can add the feeling of more living space with a few simple tricks, too. Add mirrors in rooms with lots of windows to reflect light and make rooms feel larger. Hang curtains as close to the ceiling as possible to draw the eye up and create the illusion of more space. Don’t push furniture against the walls to make rooms appear deeper and larger. If you’re not using these tricks, it’s time to start.